View More In Paper Folders. 5 pre-programmed fold types: half fold, letter, double parallel, z-fold, and gate. Able to make custom folds. Accepts stapled documents, 5 sheets at 20 lb. bond maximum. Accepts both coated and glossy paper. Removable fold tables and easy access rollers. Conveyor exit table makes stacks of folded documents. Thermal overload protection for increased electrical safety. Auto jam detect helps prevent folding problems. 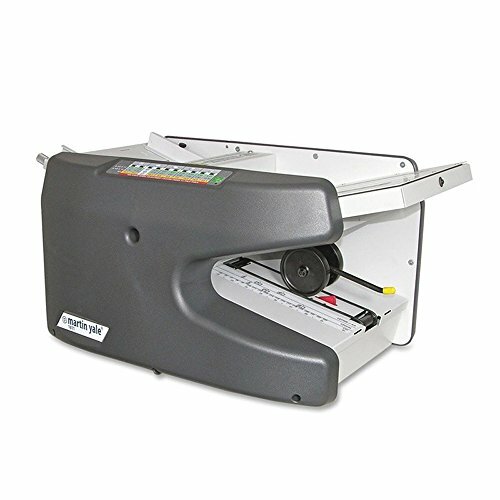 Automatic and manual paper feed ability. Paper Size: 4-3/4" x 5" to 8-1/2" x 14"
If you have any questions about this product by MARTIN YALE, contact us by completing and submitting the form below. If you are looking for a specif part number, please include it with your message.